10 Reasons To Provide CPR Training For Your Staff — Get CPR Done! Nationwide CPR Training. Low Cost. High Engagement. Heart disease, as we know, is one of the leading causes of death. According to the American Heart Association, in one year alone, nearly half a million Americans die due to cardiac arrest. At an international level, it claims more lives than any other cancer, disease, or type of accident combined. Of that insanely high number of Americans that die from cardiac arrest, 10,000 die in the workplace. Another 350,000 cardiac arrests happen outside of hospitals. These numbers are no joke. Seriously. Our CPR training ensures that neither you nor your co-workers are a statistic, and you can act quickly and effectively to save the lives around you. CPR is short for cardiopulmonary resuscitation. In less confusing terms, it is an emergency medical action that includes performing operations such as chest compressions and ventilation methods, to keep an individual alive long enough for them to receive proper medical assistance. The faster that it is administered, the better. Research shows that CPR performed within the first few minutes can double or nearly triple an individual’s chance of survival. If some of those reasons didn’t sway you, here are ten more that just might. They say knowledge is power and “they” couldn’t be more correct. Imagine knowing that every single staff member was equipped to deal with emergency situations quickly. Then, imagine if every staff member knew how to do deal with emergency situations like providing CPR and first aid. Now, imagine that every single CPR-certified staff member knew not only how to do CPR effectively, but also their actual jobs more effectively. If you’re not feeling on top of the world right now, then we don’t know what to tell you. CPR certification is not only preferred but required by some states and non-medical professions. 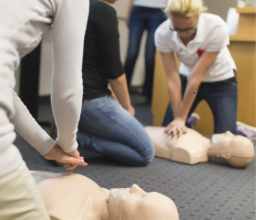 Some states have regulations that require some or all of its workers to be CPR-certified. Some of these professions include construction workers, coaches, firefighters, and daycare providers. But, even if your business doesn’t require individuals to be CPR-certified, they still should be. It’s natural to panic in emergency situations. By training your staff to recognize possible symptoms of a heart attack or cardiac arrest that could eventually spin out of control, you could help them respond quickly. When you’ve got mere seconds being the difference between life and death, it matters that your employees can react swiftly. Many of these possible warning signs are highlighted in our CPR-training course. CPR courses can take anywhere from 2-4 hours long. But depending on smaller or larger groups, that length could vary. We strongly doubt there’s anything you can learn in about 3 hours that is as effective as this. Lower anything should be drawing you in right now. Most companies that have CPR-certified staff have lower insurance rates because they don’t have to make claims that cover certain medical costs (like CPR which you and your colleagues can provide). There’s no point in paying a higher insurance premium to do the same tasks that anyone in your office can do (or when that same cost can go towards next years raise). Hide this from your boss, please. One corporate CPR course can cost anywhere between $25/person to $50/person (with some outliers here and there), but could potentially save each tens of thousands of dollars per year in possible hospital and insurance fees. Compared to the increased yearly cost of higher insurance premiums and more expensive health bills, registering for CPR training doesn’t sound too bad. Unlike useless high-school and maybe even college skills that you never once used outside the classroom, CPR is something that can be used everywhere and anywhere. If you face a stressful situation, let it be one that you know you can handle and not something you wish you could have. A 2015 review by the Institute of Medicine states that only 3% of adults take a training course each year. By joining, you might as well consider yourself more exclusive than some of the most prestigious institutions in the world. Do you have an exceptional quality that makes you stand out from the rest of the crowd? Maybe it’s having vocals like Beyonce, or an intuition like Oprah. There’s no denying that being good at something can dramatically improve your confidence and make you feel like there is absolutely nothing you can’t do. We want performing effective CPR to be added to that (probably incredibly long) list of incredible qualities. There are some things that not everyone can learn. For some, it's learning how to do complicated math problems like differential equations. For others, it’s learning how to be a better person. We know that you don’t have to be good at either of these, but we do know that you are capable of learning how to provide quality CPR. We have strong faith that our CPR training is something you and your staff can conquer alongside one another. Get CPR Done is a trusted brand in providing not only first aid and CPR training but business continuity and safety plans. If you’re interested in strengthening your companies wellbeing and providing them with life-saving (and life-changing) training, then get in touch with us! To learn more about our services and how we can help you, call our team at 310.694.5860 or send us an email at support@getcprdone.com. We look forward to hearing from you!